When you select a peg or drawing layer in the Camera view and move it around, Harmony will automatically create keyframes on the corresponding function curves. If you want to modify these curves, you can do it through the peg or drawing layer parameters in the Timeline view. Harmony lets you also flip between the selected layer's keyframes in the Timeline view. 1. In the Timeline view, double-click on a drawing or peg layer. 2. Identify the section for the type of function you want to create. 3. 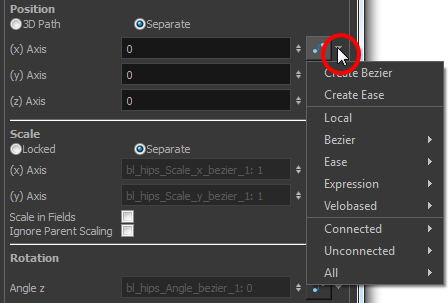 Click the drop-down arrow at the end of the corresponding row and select Create Bézier or Create Ease. 1. On the right side of the Timeline view, select a cell on the layer’s function that you want to animate. ‣ Right-click the selected cell and select Insert Keyframe. ‣ In the Timeline view menu, select Motion > Insert Keyframe. 1. On the right side of the Timeline, select a keyframe to delete. You can [Shift]+click several keyframes to select a group before deleting the keyframes. ‣ Right-click on the selected keyframe and select Delete Keyframes. ‣ In the Timeline view menu, select Motion > Delete Keyframes. ‣ In the Timeline View toolbar, click on the Delete Keyframes button. If you select a keyframe or group of keyframes and press Delete, the corresponding drawings on that cell are also deleted. 2. At the top of the Timeline view, click the Show/Hide Data View button. 3. 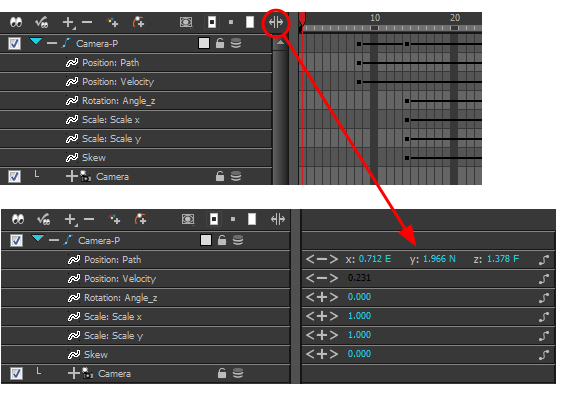 Select the parameter for which you want to create a function curve: Path, Velocity, Scale; x or y, Angle, or Skew. ‣ Double-click on the blue number and enter a value into the field that appears. 1. In the Camera or Timeline view, select the layer that contains the keyframes you want to flip through. 2. From the top menu, select Animation > Go to Previous Keyframe or Go to Next Keyframe or press semicolon (;) and single quote (').